When extreme stress manifests as a breaking point, like suicide, agricultural communities face unimaginable tragedy and loss. Stress, depression, and suicide are on the mind of agricultural communities, where economic, social, and environmental forces challenge the health and safety of farmers, agricultural workers and their families. As a result of panels, conversations, press coverage, legislative attention and more, it’s been clear that farmers, agricultural workers, and their families have been going through extremely stressful times, often with little opportunity to access help. The Upper Midwest Agricultural Safety and Health Center (UMASH) identified the need to engage, understand, and prepare rural communities for this evolving problem as a critical issue for the UMASH Emerging Issues Program. 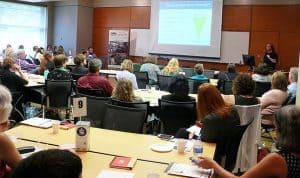 With the help of the Minnesota Department of Agriculture, UMASH convened a forum in June of 2018: Building Resilient Agricultural Communities. The forum was designed to facilitate a conversation to understand and address the challenges of ensuring appropriate community and rural health resources for mental health, and to stimulate the formation of partnerships to address this complex problem. The forum included a Keynote address from Meg Moynihan, a dairy farmer and employee of the Minnesota Department of Agriculture who has firsthand experience with how forces completely beyond the control of an individual farmer can bring extreme stress. A panel discussion followed with Doris Mold (farmer, MN Agri-women), Cynthie Christensen (RN and counselor), Gene Hugoson (farmer and former Commissioner of Agriculture), Paul Force-Emery Mackie (Mankato State and Past President of the National Association of Rural Mental Health), and Gloria Contreras (former agricultural worker and current board president of the Manos Latinas coop). They provided insight into some of the nuances and complexity of the problem to open and stimulate conversation. The forum participants learned about the different forces and circumstances that bring stress to farmers, agricultural workers and their families. 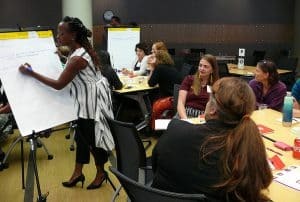 The afternoon was dedicated to workgroup discussions focused on identifying gaps and challenges of rural and community health in our region, followed by a brainstorming and crowdsourcing session to discuss ideas for addressing these challenges. Includes the executive summary, presentations, Q&A, resources, and photo gallery. UMASH requested partnership proposals to build on the day’s discussions. develop programs, and expand partnerships that address rural mental health resilience. A number of intriguing ideas were put forward. Jeff Bender, Co-Director of UMASH, was greatly encouraged to see the “shared ideas and plans that were connecting and supporting our rural communities.” Three partnership activities are being implemented which will enhance existing emergency resources, communication and training methods, and regional educational programs, and also target specific groups including women and young people. Building Resilient Agricultural Communities embodied One Health in action. We brought together diverse stakeholders and disciplines with the challenge to build partnerships to address mental health in agricultural communities. Continued collaboration, conversation, and action is necessary. UMASH is encouraging forum attendees and others to keep this work moving forward. 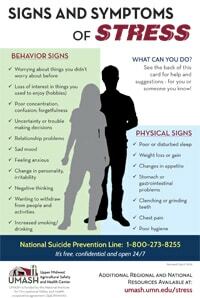 A tangible outcome of the forum was the development of a “Signs of Stress” poster.